We want you to enjoy your golf car and get the most use out of it as possible. Because of this, we know that parts are going to suffer some wear and tear over the years. We are here to repair and replace any necessary parts to keep your car running in prime condition. Call us today to discuss your specific golf car part needs. At NB Golf, we take pride in working with our customers throughout the life of their Club Car. We provide all of the necessary resources to keep your car looking nice and in like-new running condition. We have professional service technicians trained to service all makes and models of golf cars and golf-type recreational vehicles. Our Club Car certified service specialists are factory trained at Club Car in Augusta, Ga., and we have three service technicians at each of our three locations. 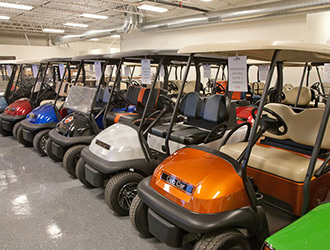 In addition to our service training and technician background, all of our certified retail electric golf cars have gone through a 24-point inspection and our gas cars have gone through a 35-point inspection with our experienced staff before they are sold to the public. When you purchased a Club Car, you didn’t just buy a golf car—you bought years of research and product innovation. The best way to maintain your vehicle is through Club Car genuine parts and trained service technicians. Please contact one of our locations to discuss your service needs. To purchase a printed copy of an Owner’s Manual, Illustrated Parts List, or a Maintenance & Service Manual, please contact one of our store locations.